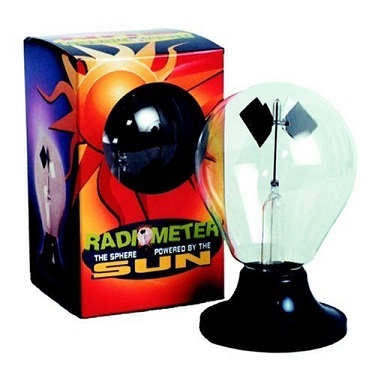 This toy, called a radiometer (or a light-mill), consists of four vanes balanced on a vertical support, which can rotate with very little friction. The vanes are inside a glass sphere which is sealed at a partial vacuum, which is a necessary condition for the radiometer to work. When the radiometer is placed in direct sunlight, the radiation from the sun causes the four vanes to rotate. This happens because one side of each of the vanes is painted black and the other side is painted white. The white side of the vanes reflect light energy and the black sides absorb light energy. As a result the temperature of the black side increases. The higher temperature black sides create a net effect at the edges of the vanes in which air molecules (heated by the black surface) move around more quickly and “repel” off the vane edges. This creates a pushing force which causes the vanes to rotate. The vanes will only spin when there is a strong enough light shining on the radiometer. The sun provides a powerful source of light energy, while an indoor light bulb may not be able to provide enough energy for the vanes to rotate. A flashlight can cause the vanes to rotate, as the video shows.